Unlike most content marketing, marrying the charming prince is the stuff fairytales are made of. So it’s no surprise that Prince Harry’s marriage to Meghan Markle, like Prince William’s marriage to Kate Middleton, has attracted lots of attention. Further, as Princess Diana’s son, Harry fuels our guilty desire for related news and gossip. Like Kate Middleton, Meghan Markle may be a real-life Cinderella but she’s no scullery maid! From the point of view of British royalty, a form of branding on a national level, Markle is both divorced and American. While trying to be non-political, British royals represent traditions that have not only stood the test of time, but also have evolved just as Queen Elizabeth II has with her acceptance of her grandson Harry’s choice of bride. 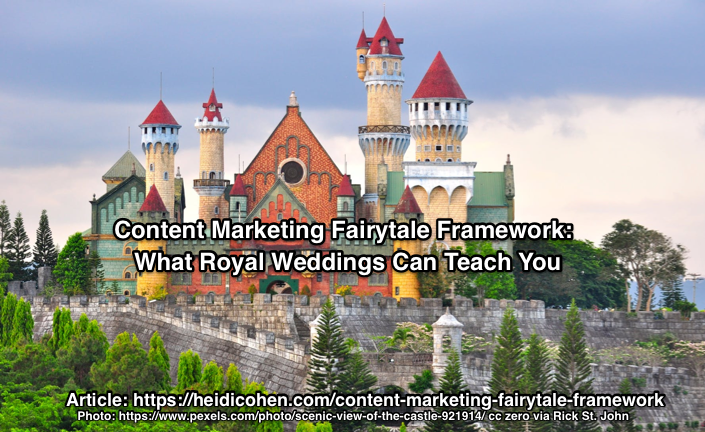 Like the royal wedding, here’s a content marketing fairytale framework to improve your results. A lot of content marketing falls short of expectations because marketers don’t take the time to tell their full story. Instead they rush to close the deal and jump to the conclusion. Problem: Explain their difficulty or needs. Action: Provide remedies using your products and services. Result: Show the benefit of these actions, preferably in measurable terms. Because your audience wants and needs to hear you tell your full story including the fairytales. It makes your information connect with your audience by engaging them. In the process, your business, brand and offering come alive and stay memorable. John Hopkins University researcher Keith Quesenberry with help from Michael Coolsen analyzed 108 Super Bowl Ads to determine the power of storytelling techniques. They chose 30 second Super Bowl ads since their length allowed for complete storytelling. Further, fairytales with happy endings trigger the brain’s limbic system to release dopamine. This makes you feel more hopeful and optimistic. In the process it helps get your audience’s attention. For the full power of fairytales, your content needs a dramatic arc. 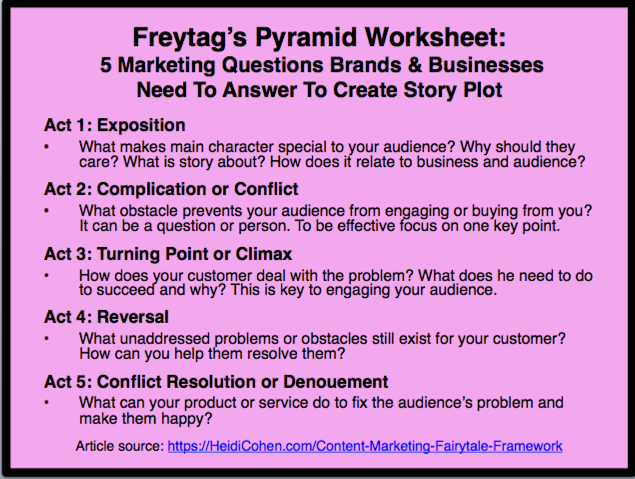 Use Freytag’s pyramid to structure your content to draw your audience in. Act 1: Exposition – Sets up the story and introduces the protagonist. Your objective: Make the story relevant to your audience so they care. What makes the main character special to your audience? Why should they care? What is the story about and how does it relate to your business and your audience? Act 2: Complication or Conflict – Something happens to the protagonist that keeps him from accomplishing his goal. 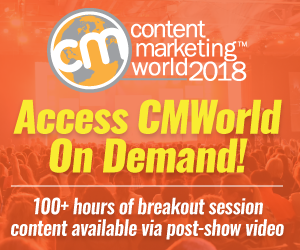 What obstacle prevents your audience from engaging or buying from you? It can be a question or person. To be effective focus on one key point. Act 3: Turning Point or Climax – This is where the story’s action builds to a high point where it seems like the protagonist will succeed. How does your customer deal with the problem? What does he need to do to succeed and why? This is key to engaging your audience. Act 4: Reversal – Just as everything looks like it will work out happily, something happens that will change the outcome. What unaddressed problems or obstacles still exist for your customer? How can you help them resolve them? Act 5: Conflict Resolution or Denouement – What happens to make the new problems go away so the protagonist lives happily ever after? What can your product or service do to fix the audience’s problem and make them happy? More than getting saved by handsome princes (although that doesn’t hurt! ), fairytales provide content marketers with ready-made plots. Like recipes for content creation, all you have to do is to add your business’s specifics. 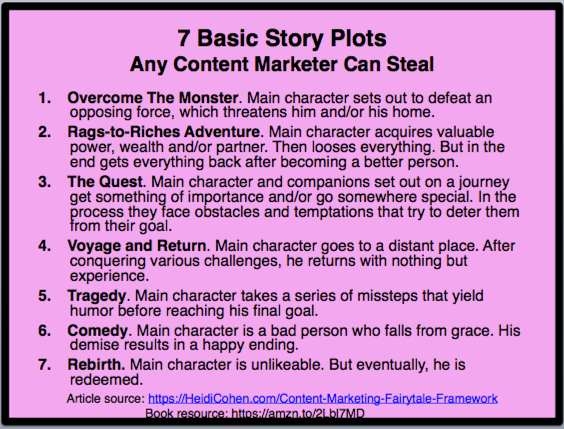 In The Seven Basic Plots: Why We Tell Stories, Christopher Booker defined 7 key story plots. Only use the ones that apply to your business and audience. Overcome The Monster. The main character sets out to defeat an opposing force, which threatens him and/or his home. Rags-to-Riches Adventure. The main character acquires valuable power, wealth and/or partner. Then looses everything. But in the end he gets everything back after becomingn a better person. The Quest. The main character and his companions set out on a journey to get something of importance and/or go somewhere special. In the process they face obstacles and temptations that try to deter them from their goal. Voyage and Return. The main character goes off to a distant place. After conquering various challenges, he returns with nothing but his experiences. Tragedy.The main character takes a series of missteps that yield humor before reaching his final goal. Comedy. The main character is a bad person who falls from grace. His demise results in a happy ending. Rebirth. The main character is unlikeable. But during the story, he is redeemed. Fairytales are targeted at children. As a result, they’re easy-to-tell and to remember. Even better, they often have an underlying message. Integrate the best of this storytelling format into your content marketing to improve results. Use these 5 ways regardless of your business-focus. Focus your content marketing stories on a single important idea. Try to explain too much and your audience is gone or asleep. Like a storyteller, use every detail to support this one point. Use simple language. Research shows that you should write for an 8th grade reading level. Easy-to-understand words appeal to a broader audience and make your content easier to remember. Add an emotional element to your content. As a result, your content marketing engages your audience better. Also it helps improve audience attention. Allow and, even, invite retelling. Like children, your audience is willing to listen to your stories again and again. This is important since customers need to see or hear a marketing message 5 to 8 times before taking action. Are easy-to-reuse. 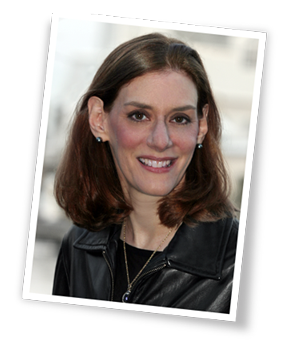 Fairytale content is perfect for transforming into other content formats. 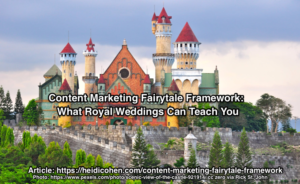 While it’s too early to know if Prince Harry and Meghan Markle will live happily ever after, your content marketing fairytale framework can still yield successful results. Use fairytales to give your content marketing human emotion that’s relatable and memorable. 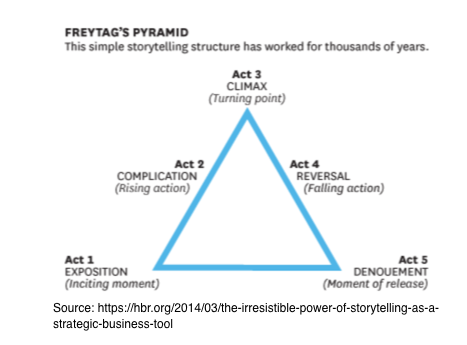 Even better, use Freytag’s story structure pyramid together with one of the seven fairytale plots to make your content successful. BTW, Quesenberry found that the more complete the Super Bowl ad story used Freytag’s Pyramid, the more popular the ad was. 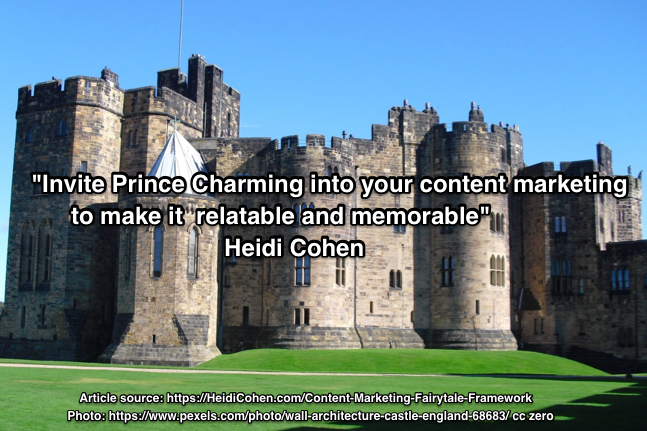 Go on invite Prince Charming into your content marketing. I bet it’ll make your job easier and your content more fun to consume! Tags Blogging, Fairytale, Freytag's Pyramid, kate middleton, Meghan Markle, Prince Harry, prince william, Story, Story plot. Bookmark the permalink.